People inspect damage at a site hit by what activists said were barrel bombs dropped by forces loyal to President Bashar al-Assad in Aleppo on March 7, 2014. The air attacks on Aleppo and its countryside have killed and wounded large numbers of civilians and led to large-scale displacement. One local group estimated that the attacks have killed 2,321 civilians in Aleppo governorate between November 1, 2013, and March 21, 2014. 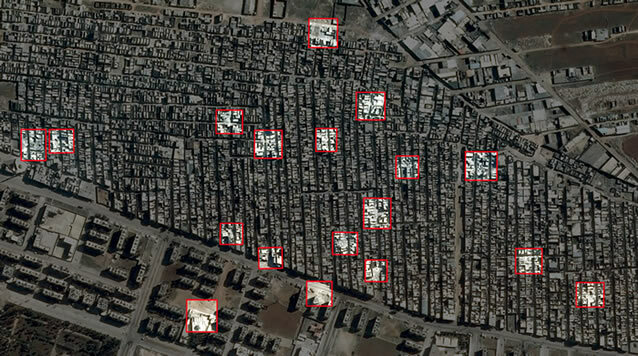 Using satellite imagery analysis, Human Rights Watch identified at least 340 distinct sites in Aleppo city’s opposition-held neighborhoods that were damaged between early November and February 20, the date of the most recent image reviewed. The majority of these identified sites have damage signatures that are strongly consistent with the detonation of barrel bombs – unguided high explosive bombs, which are cheaply made, locally produced, and typically constructed from large oil drums, gas cylinders, and water tanks, filled with high explosives and scrap metal to enhance fragmentation, and then dropped from helicopters. Damage sites were widely distributed across almost all neighborhoods under opposition control, with a majority falling in heavily built-up residential areas far from the frontline. In most of the cases about which Human Rights Watch spoke to witnesses, the witnesses said there were no military targets nearby, reflecting the indiscriminate nature of the strikes. Caption: Map of the 340 major damage sites identified between November 1 and February 20, 2014. In mid-March – after the Security Council called for an end to barrel bomb attacks – refugees newly arrived in Turkey, and other people displaced inside Syria, described to a Human Rights Watch researcher recurrent, almost daily indiscriminate air attacks on residential and commercial areas in Aleppo, mostly by barrel bombs, far, they said, from any conceivable military target. The residents spoke consistently about seeing helicopters drop barrel bombs over them, the characteristic noise of the bombs while dropping and of seeing unexploded bombs, and remnants of what were clearly barrel bombs. The repeated use of barrel bombs and other unguided high explosive bombson heavily built-up residential areas shows that these are not isolated incidents but suggest a strategy of deliberately attacking such areas. For instance, satellite imagery shows over 30 probable air strike damage sites in the residential neighborhoods of Masaken Hanano and Jouret Awad in Aleppo city, destroying more than 100 buildings. Human Rights Watch was unable to reach witnesses from Jouret Awad, but two witnesses from Masaken Hanano told Human Rights Watch that while there was an opposition barracks in the neighborhood that neither these barracks nor any other military target were near the areas struck by barrel bombs. According to the Violations Documentation Center (VDC), a Syria-based monitoring group, there were more than 266 airstrikes on Aleppo and its countryside between November 1, 2013, and January 31, 2014, killing at least 1,380 civilians, including 441 children, 78 women, and 14 combatants. Based on interviews with doctors and hospitals, VDC estimates that more than 20,000 were wounded as a result of these attacks. The organization has recorded 2,321 fatalities from airstrikes in the same region between November 1 and March 21. The Syrian Network for Human Rights (SNHR), another local group, has reported that the government’s airstrikes on Aleppo city and surrounding rural areas killed 2,426, including 2,401 civilians, between November 23, 2013, and February 24, 2014. The air campaign has also displaced large parts of the civilian population from opposition-held Aleppo. A Syrian relief coordinator in the Turkish border town of Kilis who was registering refugees living in urban areas told Human Rights Watch in mid-March that approximately 5,000 to 6,000 families from Aleppo had sought refuge in Kilis since the government’s air offensive intensified in November 2013. Military commanders should not, as a matter of policy, order the use of explosive weapons with wide-area effects in populated areas due to the foreseeable harm to civilians, Human Rights Watch said.By using barrel bombs on densely populated areas, Syrian government forces used means and methods of warfare that could not distinguish between civilians and combatants, making attacks indiscriminate and therefore unlawful. Given Syria’s continuing indiscriminate air war against civilian areas, the Security Council should impose an arms embargo on Syria’s government, as well as on any groups implicated in widespread or systematic human rights abuses, and refer the situation to the International Criminal Court (ICC), Human Rights Watch said. Such an embargo would limit the Syrian government’s ability to conduct aerial attacks, including by ensuring that Syria does not receive new helicopters or have its current helicopters serviced overseas. Further, in light of compelling evidence that the Syrian army and security forces are responsible for ongoing war crimes and crimes against humanity against Syria’s people, companies and individuals that continue to provide arms, ammunition or materiel to Syria or to opposition forces that have been implicated in crimes against humanity or war crimes risk complicity in these crimes, Human Rights Watch warned. For more detailed accounts, see below. Human Rights Watch identified at least 340 distinct damage sites in Aleppo city’s opposition-held neighborhood damaged between early November and February 20, 2014, by analyzing four satellite images recorded over the city between October 31, 2013, and February 20, 2014. The heaviest concentration of the 340 distinct damage sites identified in Aleppo city were in the neighborhoods of al-Marjet, Jouret Awwad, al-Myassar, Helwaniye/Tariq al-Bab, Salheen, al-Sakhour, al-Heidariyya, Dahret Awwad, and Masaken Hanano. Both the level and the location of this destruction varied from the damage Aleppo had seen prior to this government offensive. Approximately 300 major damage sites were identified from earlier dates of satellite imagery recorded between mid-2012 to October 31, 2013, a number now exceededin less than four months. And the pattern of these sites shifted, with earlier sites more concentrated in certain neighborhoods and closer to disputed areas, and the newer sites revealing wide scale destruction of neighborhoods that had been relatively undamaged and were further from active conflict. Although some of the damage sites identified in the satellite imagery were likely caused by the effects of other explosive weapons, such as prolonged artillery shelling and a handful of apparent attacks by guided munitions, a substantial majority of these 340 sites have damage signatures strongly consistent with the detonation of high explosive unguided bombs. Human Rights Watch has further determined from a review of YouTube videos, satellite imagery and testimony that a small number of damage sites identified near front line positions since the beginning of the government offensive are likely attributable to opposition forces. In one documented case opposition forces dug tunnels under government-held positions near the citadel and detonated two large explosive charges destroying multiple buildings and possibly damaging the ancient citadel between February 2 and 20, 2014. Barrel bombs account for much, if not most, of the damage that Syria’s aerial campaign has inflicted on Aleppo’s residential neighborhoods, Human Rights Watch has concluded, based on its examination of satellite imagery, video footage, and witness testimony. Human Rights Watch reviewed over 70 videos posted to YouTube during this period, to verify the use of barrel bombs by government forces, assess the scale of damages and establish the presence of civilians at the time of the attacks. When possible, the video recording locations and impact sites as seen in videos were determined by matching common landmarks with satellite imagery. Many videos reviewed clearly show government helicopters releasing one or more barrel bombs over residential areas in Aleppo, as distinguished by their large shape and usually unstable motion while in free fall. Barrel bombs also are distinguished because they are often pushed out or dropped from the back ramp of the helicopter. Human Rights Watch also reviewed videos of the unexploded barrel bombs on the ground. In one case, a video posted to YouTube on February 2, shows a government Mi-8/Mi-17 “Hip” multipurpose helicopter dropping three barrel bombs on the neighborhood of Tariq al-Bab during a 10-minute period. 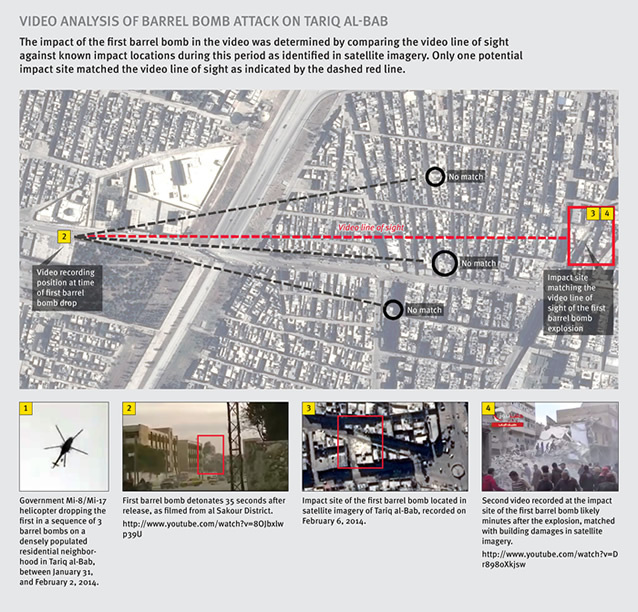 Human Rights Watch identified both the exact video recording position as well as the location of the first barrel bomb impact site shown in the video by matching it with common landmarks in satellite imagery. A second video of the aftermath of the first attack posted to YouTube on the same day shows the destruction of at least three buildings, as well as a large civilian presence at the time of the attack. Human Rights Watch determined the incident occurred between January 31 and February 2 based on satellite imagery. Caption: Video of Government Mi-8/Mi-17 helicopter dropping barrel bombs on residential areas matched to satellite imagery. Human Rights Watch also interviewed 30 Aleppo residents, most of them after they escaped the city, about air strikes between December 2013 and March 2014, and corroborated their statements wherever possible by analyzing video and photographs posted on the Internet. All those interviewed described helicopters hovering high over their neighborhoods and dropping barrel bombs. In all but one case of barrel bomb attacks that residents described to Human Rights Watch, witnesses said there were no military targets nearby at the time of the attack. One witness from Masaken Hanano told Human Rights Watch that fighters from armed opposition groups were sleeping in residential buildings in the neighborhood at the time of the attack, but that they were not near the strike site and were not hit. According to witnesses who spoke to Human Rights Watch, on February 23 a barrel bomb hit a family compound approximately 100 meters from Hraytan public square killing three civilians, including a child, and injuring two more. Human Rights Watch spoke with several members of the Masri family, whose house was hit, who explained that Hassan Mahmoud Masri, approximately 70 years old, was killed in the attack along with his five-year-old grandson, and neighbor Fouad Ali Belkesh. The Violations Documentation Center identifies Hassan Masri, Ghaith Masri, a child, and Belkeshas having been killed by barrel bomb strikes on Hraytan on February 23. According to the relatives, the attack also injured Masri’s two adult daughters, one of whom lost her right arm. Human Rights Watch reviewed a video taken of the aftermath of the attack shortly after it took place with a family member who identified the victims. This relative also explained that there were no military positions near the home or the town square, which he described as an active commercial area. In the last days of February two barrel bombs struck a residential building in the Anzarat neighborhood at approximately 11:00 a.m., witnesses said. “Wajih,” (names in quotes have been changed to protect the identifies of the witnesses) one of the residents of the building, originally from Azaz, which he had fled to escape government shelling, told Human Rights Watch that the attack took place while he, his wife and five children, the youngest just 20 days old, were home. He said that his wife, father, and brother were all injured in the attack, along with another woman who lost her arm and eye. He said that he also saw two people killed in the attack, a man who lived in his building and a 45-year-old woman. He told Human Rights Watch that the nearest front line was four kilometers away, and that their home was in a residential area with schools and mosques in it, but no military sites, checkpoints, or fighters. The Syrian Air Force has repeatedly hit the Haidariyeh roundabout, a key intersection on one of the main roads connecting opposition-controlled Aleppo to the countryside. The roundabout is also a gathering point for buses serving the Aleppo countryside, so it is usually crowded with civilians, residents told Human Rights Watch. Human Rights Watch has previously reported on attacks in Haidariyeh including on December 15 and 16. Three witnesses also told Human Rights Watch that the roundabout was attacked more recently. Two residents told Human Rights Watch on March 17 that the roundabout was attacked about 20 days beforehand. One resident, “Samer,” said that three barrel bombs struck the roundabout one right after the other, killing civilians who were in taxis and microbuses there. A second witness, “Nidal,” speaking about the same attack, said that while he was leaving Aleppo for the countryside, barrels struck the roundabout, hitting microbuses that were parked there. “A Suzuki full of displaced people was hit in the Haidariyeh roundabout and other microbuses were also hit with a barrel bomb. Thirteen people from the same family died,” he said. Wajih also told Human Rights Watch that on March 13 while he was on his way back to Aleppo, the roundabout was again struck by two barrel bombs on the Haidariyeh bus gathering point, where cars and microbuses were parked. He could not estimate the number of dead, but said that large numbers of residents in cars that were hit were killed. In an aerial attack on the evening of March 12 two bombs fell on east Anadan, a town northwest of Aleppo, killing members of the al-Ateek family. A witness from Anadan who saw first responders taking the injured to hospitals and collecting corpses, told Human Rights Watch that Ahmed al-Ateek’s family of five was killed in the aerial attack by barrel bombs that fell on their home and that approximately 30 other people were injured in the strikes. He described the area as residential and told Human Rights Watch that armed groups are not present in the vicinity. The Violations Documentation Center identifiedfour members of the al-Ateek family who were killed on March 12 in Anadan in an airstrike: Hassan al-Ateek, Zalegat al-Ateek, and two children, Khadija Mohammed al-Ateek and Imad Mohammed al-Ateek. Wafa’s mother explained that one leg was severed in the initial attack, but that the other, which was also injured, was later amputated at a hospital in Turkey. She told Human Rights Watch that they knew a barrel bomb caused the injuries because a relative saw the bomb falling towards them from a helicopter. She said that there were no armed opposition military positions in their town but that there was an opposition-run police station there, although this was one kilometer away. While this was the first barrel bomb to hit their neighborhood, Wafa’s mother explained that it is not the first time their neighborhood has been bombed, despite it being a residential area. Human Rights Watch also reviewed five videos taken shortly after the attack. In oneof these videos a girl seen being carried by a man was identified by the videographer as Noura. He estimated that the closest military target was about five kilometers away. The witness believed that dozens of market-goers were killed in the attack. The Syrian Network for Human Rights has identified36 individuals, including seven children, who were killed by barrel bombs in the Tariq al-Bab vegetable market on December 28. The Violations Documentation Center has identified 20 victims, including four children. 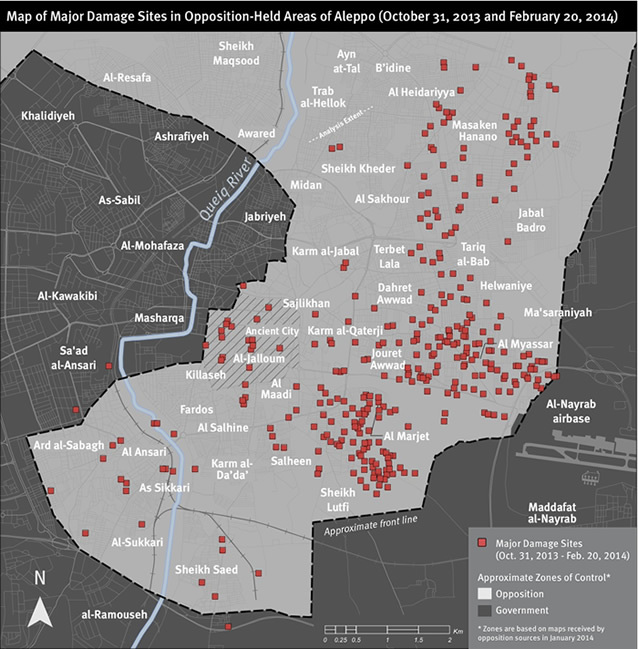 Human Rights Watch has identified a total of 35 distinct impact sites in the Masaken Hanano neighborhood in north-eastern Aleppo between early November 2013 and February 20, 2014. A majority of the attacks occurred between February 6 and 20. Most of the sites have damage signatures strongly consistent with the use of barrel bombs and possibly conventional bombs dropped by helicopters. Impact sites are almost exclusively located in neighborhoods with a high density of residential buildings. In addition to the 35 main damage sites, multiple impact craters from artillery shelling were also identified, indicating that both government ground and air forces have targeted the district. Caption: The map illustrates 17 probable air strike / barrel bomb impact sites (highlighted in red) concentrated in the middle of a large residential area on the eastern side of Masaken Hanano. All but one attack in this section occurred in February 2014. Human Rights Watch spoke to two witnesses from Masaken Hanano who described two separate barrel bomb attacks on the neighborhood in February in which civilians were killed or injured. “Bassel,” a media activist from Masaken Hanano, told Human Rights Watch that on February 6, he documented a barrel bomb attack in the eastern section of the neighborhood. Before the attack he saw a helicopter hovering over the neighborhood and then received a call from a friend who told him the helicopter had dropped a barrel bomb there. He said that on arriving at the scene approximately 20 minutes after the barrel bomb struck, he saw 14 civilians who were killed, including four women and two children, two buildings destroyed and several others damaged, and six to seven destroyed cars. Bassel identified 11 of the victims by name: Abdul Kader Tabakh, Mohammed Rihawe, Abd al-Mohsen al-Hamawi, Mohamed Mahmoud Tedabli (16), Ahmad Ramadan al-Sharif, Bushra Abdulkader Tabakh, Shahla Abdulkader Tabakh, Hiba Abdulkader Tabakh, `Ala’ Tabakh, Ameen Abdulkader Tabakh (6), and Sama al-Hassan (6). “One man was holding a dead child who looked around five years old to me,” he told Human Rights Watch. Others were injured. “The injuries that I saw were mainly severed legs and hands, and injuries caused by shrapnel,” he said. “I don’t remember the number of injured but I saw at least 20.” He told Human Rights Watch a second barrel was dropped on the northern section of the neighborhood on the same day, killing civilians, but that he did not document it. Bassel said that there was no armed opposition group presence at the time, whether fighters, checkpoints, or a military base, and that the frontline was 10 kilometers away. “Mansour,” a media activist from the neighborhood, told Human Rights Watch that on February 10 at around 8:30 a.m. a helicopter dropped four barrel bombs in the southern part of the neighborhood near the cemetery in al-Ahmadiya. He said that he was meters from where one of the bombs dropped on a residential street and that he saw one man and woman on the street injured by that bomb. Mansour told Human Rights Watch that while there was an opposition barracks in Masaken Hanano, the frontline was five kilometers away near the Syrian government’s 80th Brigade base. In mid-February at around 5:30 p.m. a bomb that witnesses described as a barrel bomb struck a one-story home in the Nayrib neighborhood of Aleppo city, killing a mother and her three children and injuring a fourth child. The witnesses interviewed by Human Rights Watch were unable to recall the exact date. The children’s father told Human Rights Watch that his wife, Diyah Wawee, and Hasan, 18 months, Abdelkarim, 3, and Ahmed, 10, were killed in the attack and that their fourth son was injured. He also told Human Rights Watch that the same bomb killed his brother’s son, Mohammed, 10, and daughter, Fatima, 2, and a third child, Mohammed al-Ali Wawee. He said that the bomb hit their homes in a residential area where no military targets were present. Human Rights Watch spoke to four men from the Hendarat Palestinian refugee camp, northeast of Aleppo city, who said they had fled the area with their families because of the government’s barrel bomb attacks on the camp. According to the men, surrounding neighborhoods were hit with barrel bombs in the days before the camp itself was struck on February 21, after which more than 200 camp residents from 48 families decided to flee to Turkey. One man, “Omar,” told Human Rights Watch that this was the third mass displacement from the camp because of the war, and that almost none of the original 7,000-8,000 inhabitants remained. A second resident, “Bassam,” told Human Rights Watch that three barrel bombs struck part of the camp on February 21 (the Mashrou` section), at around 11:20 a.m., before Friday prayer. He said that one of these strikes killed a girl and her mother as they were walking near the water tank in the neighborhood. Omar and two other residents also spoke to Human Rights Watch about the attack on February 21. None of the residents knew the names of the women and girl victims, and believed they were Syrians who had moved in to escape government attacks in other parts of Aleppo governorate. The residents also told Human Rights Watch that there were no military positions inside of the camp, characterizing it as a residential area far from the frontlines. The camp, they told Human Rights Watch, is administered by a local opposition Sharia council, which the residents described as civilian. The Sharia council was not in the Mashrou` area of the camp that was hit.